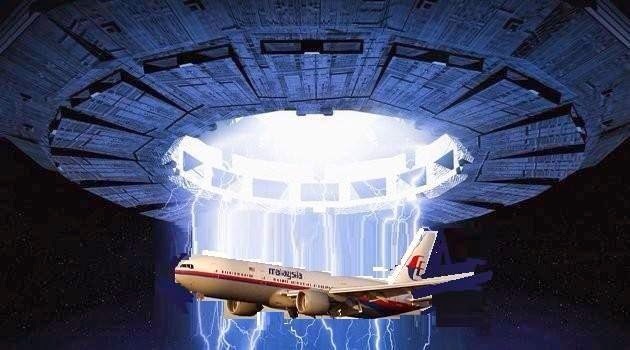 Did Missing Malaysia Jet Encounter A UFO? In steps, Feschino is a researcher and author of the UFO/military history books, Shoot Them Down — The Flying Saucer Air Wars of 1952 and The Braxton County Monster-Updated and Revised Edition. He is by no means a stranger to researching missing planes and pilots, military aircraft accidents, UFOs and government cover-ups. Feschino's primary case study, a case involving a missing USAF F-94 jet and 2-man crew—simply vanished into thin air, like the 777, while being tracked by several Air Force radars on September 12, 1952! Frank spent several years investigating this documented, but convoluted and mysterious, incident. He then reconstructed and recreated a precise scenario of events for this unexplained mystery entirely resurrecting the memory of forgotten pilots involved in the mishap! It follows that after talking with Frank the past week I came to realize that he had some very interesting points to raise concerning this missing Malaysian jet above. I've worked with Frank over many years, done several radio shows with him as well as a History Channel TV program. I must allow that he is in no way scared to talk about controversial topics or give his point of view, a view with a lot of non-stretched external support. Verily, the constant reader understands neither one of us is afraid to speak our minds. Additionally, and still on task, my being a retired veteran Army Officer and former Master Army Aviator provides that I can relate to Feschino's work handily. His work is very compelling... involving, as it does, the many missing airmen and planes and crashes that he researches, investigates, and writes about. Frank's a tall order, and not just in person. That comes personal. Feschino seems uniquely positioned to provide an insight on the highly strange, and do it in a manner respectful of the sensibilities of the hundreds of worried persons involved with the mystery above. The loss of life, if that's what it is, is huge. As the days go by, the location of this Malaysian airliner is still unknown, and the mystery deepens. There has been no official explanation as to what actually occurred on that day... only speculation. The mercurial list of explanations as to what could have occurred to that Malaysian jumbo jet keeps getting longer and longer, and there are more hypotheses coming out than, at which, you could shake the proverbial stick! Did the 777 airliner suffer a severe malfunction and explode in mid-air? Was it pilot error causing the jet to crash into the sea... or did it crash undetected into a remote jungle in Viet Nam? Was the jet hijacked by terrorists and taken to an isolated area or was it taken over by a crazed passenger who forcibly gained entry into the cockpit - subsequently crashing the plane? Did one of the pilots take over the jet and crash it or fly it to an undisclosed location? Another scenario; was the jet shot down by a hostile force or—did the plane explode, lose cabin pressure and render the pilots unconscious, causing the jet to continue on pilot-less on an unguided path to an unknown area and fate? No one knows or is willing to say. In other words, as theories run rampant throughout the world media, no one actually knows what happened on that early morning of March 8, 2014. But wait...on the other hand though, I ask, are there certain individuals in high political and military positions, who actually know the true story about the missing jet and are keeping a lid on the story? Did something so horrendous occur, that the powers to be, actually chose to keep the truth from the public? It's not like it doesn't happen, eh? While the world wonders what really happened to Flight MH370 and the 239 people on board, we'll explore some other possible explanations later on, but now, a brief synopsis of the missing passenger plane incident just to nail down what can be nailed down. 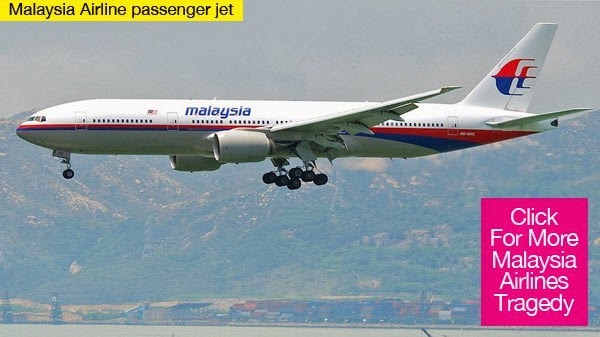 This plane, a Boeing 777-200 jet, departed from Kuala-Lumpar, Malaysia at 12:21 a.m. [1421 GMT Friday] and was scheduled to arrive at it's destination, Beijing, China at 6:30 am. [2230 GMTFriday]. The jet, which was carrying 239 people (227 passengers and 12 crew), had dropped off civilian radar about one hour into it's flight at an altitude of 35,000 feet. According to officials it disappeared without transmitting a distress signal. Now, the details of the jet's flight path indicates it departed, Kuala-Lumpar, traveled northeast over Malaysia, passed over the eastern coastline and out over an area of water where the Gulf of Thailand is located to the west and the South China Sea to the north and east. The plane's projected northeast flight path would have next taken it over Vietnam and an area of Cambodia enroute toChina, but the plane never reached the southern coast of Vietnam. Air Traffic Control officials reported the last contact with Flight MH370. This report indicated it was over water approximately 120 nautical miles east of Kota Bharu, Malaysia. Various media reports contradict the exact time that the jet dropped off civilian radar over water, but it was approximately one hour and ten minutes into its flight at about 1:30 a.m.
Now, if the reader has been following this story closely, they must have noticed the inconsistencies of the many contradicting reports made. 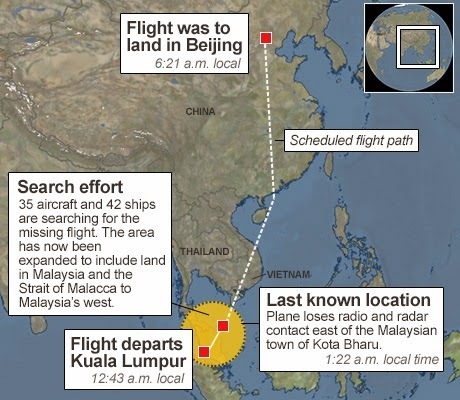 These inconsistent reports involved some of the events and time-stamps contained within this missing jet incident taken as a whole. Was this reckless reporting by the Malaysian officials or was it done purposely to confuse the events and timeline of the actual story? Additional information had also stated, "Vietnamese Civil Aviation Authority claimed the pilots of the plane did not check in at it's scheduled time of 17:21 GMT." Next, whether the plane changed direction and redirected southwest while being tracked by military radars at Butterworth, Malaysia is now a conflicted point. Malaysian officials have been changing their official statements with the position of the sun in the sky. Early reports said the plane may have redirected southwest, then updated reports said the northeast bound jet did redirect southwest, but passed over Thailand, flew over Malaysia and then over the Strait of Malacca. The jet reportedly had descended 3,280 feet in altitude and was detected by Butterworth military radars at 2:40 a.m. above the region of the tiny island of Pulau Perak to the west of Malaysia. 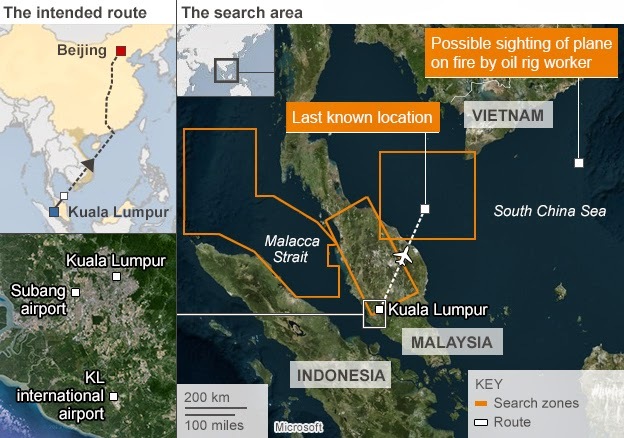 Beijing (AFP)...Malaysian air force chief General Rodzali attempted to explain why the search zone had been expanded, telling a press conference that military radar detected an unidentified object early Saturday north of the Malacca Strait off the Malaysian coast. He said that reading, taken less than an hour after the plane lost contact over the South China Sea, was still being investigated and they were not able to confirm it was MH370. Now hold the phone reader—this statement by General Rodzali confusingly reveals the radar target tracked by the Malaysian Air Force was actually, "an unidentified object." Why was this point not brought up to the press when the story first broke and the search for the jet initially began. Again reader, why so many contradictions and inconsistencies within the events of this missing commercial aircraft? Was the public intentionally misled because "an unidentified object" was involved in the incident? Walking and quacking like a full-on duck, there begs to have been a cover-up in the making from the onset of this incident! 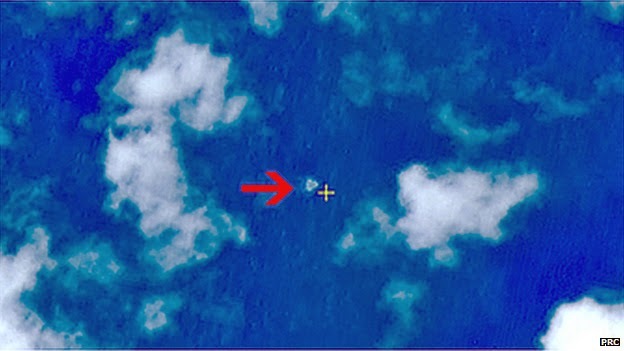 The article also stated that a Chinese satellite had detected debris images of "objects in a 'suspected crash sea area' in the South China Sea," according to the Chinese State Science and Technology Administration. "KUALA LUMPUR, Malaysia - (AP) Malaysian authorities expanded their search for the missing jetliner into the Andaman Sea and beyond on Thursday after saying it could have flown for several hours after it lost contact with the ground." The article once again talks about "an unidentified object" and states, "Malaysia's air force chief said Wednesday that an unidentified object appeared on military radar records about 200 miles (320 kilometers) northwest of Panag, Malaysia, and experts are analyzing the data in an attempt to determine whether the blip is the missing plane." The article also states, "Investigators have not ruled out any possible cause for the disappearance of the plane." How do you just throw up your hands about a missing Jumbo Jet? At this point, the fate of the Malaysian jet is still unknown. Several countries are participating in a massive search and rescue effort as several planes, boats, ships and helicopters are scouring numerous regions for the missing jet, a jet simply vanishing into thin air. As of this writing, the jet, nor any wreckage, or bodies have been found! This is even after an expansion of the original searched territory area. Let's change some gears! In order to understand what may be going on today ...let's review the past. In many cases, we can learn—and also learn lessons from our history! See, throughout aviation history, military pilots, including transport and fighter pilots as well as commercial pilots, have reported UFOs and encounters with UFOs from all parts of the globe. There is the famed July 14, 1952, Nash-Fortenberry Pan American incident, where those pilots saw and encountered UFOs over Virginia. On February 24, 1959, the famous Killian incident occurred when an American Airlines passenger plane encountered several UFOs enroute to Detroit. Captain Peter W. Killian's plane was paced and approached by several UFOs, which were also seen and reported by other nearby passenger planes. Then there is the classic 1953 Kinross AFB case where an F-89C Scorpion jet (lately in the news) vanished during a UFO intercept attempt over Lake Superior! Yes, reader, there are the numerous fighter pilots who pursued UFOs throughout the world—and still do—to protect their Countries. Moreover, these unidentified flying objects have been well documented in history by the brave human beings trammeling those hallowed halls of air. Other assorted historians point out that normally 'UFOs' are peaceful, [fighter pilots] Gorman and Mantell just got too inquisitive, they just weren't ready to be observed closely. If the Air Force hadn't slapped down the security lid these writers might not have reached this conclusion. There have been other and more lurid "duels of death." Read that again—"Lurid duels of death," reader—lurid duels of death. This statement about UFOs was straight from the Chief of Project Blue Book himself, Captain Edward J. Ruppelt. Also note how he mentions the, "security lid" being "slapped down" by the USAF! However; reader, it is still readily known that planes and UFOs have shared the skies with us for years and many strange things have happened as a result of our crossing their star-crossed path. One is compelled to ask: how many of those planes vanished during UFO encounters, including confrontations—be it by accidental encounters or intentional attempted intercepts? In the First Edition of his 1955 book, The Flying Saucer Conspiracy, pioneer UFO researcher, author and former aide to Charles Lindbergh, Major Donald Keyhoe, USMC Retired, writes a chapter titled, "The Vanishing Planes." Here, he studies the disappearance of the famous incident that involved five TBM Avengers aircraft vanishing off the Florida coast on December 5, 1945 ...and the Martin Mariner search plane that subsequently vanished while looking for them! During this era, folks, Major Keyhoe, a close friend of Charles Lindbergh, remember, was very well connected throughout both military and civilian aviation circles. Indeed Donald Keyhoe had friends in many high places, including top connections in the Pentagon. 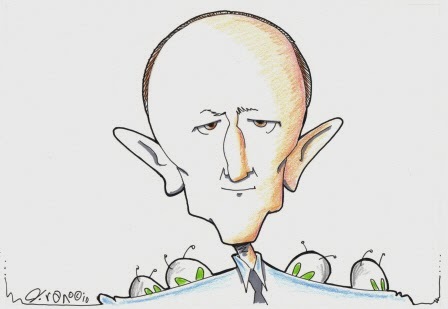 He was privy to many inside UFO reports that most would never see. Yes, Keyhoe was on top of the UFO phenomenon and made everyone around him aware that he was, a true pioneer in the field. Additionally, in this regarded chapter from above, Mr. Keyhoe and an "aeronautical engineer," named Mr. Paul Redell, who first met Keyhoe around 1949, discussed some hypothetical theories involving the five TBM planes and the Mariner that vanished in 1945. In concert with the Malaysian jet disappearance, the two men talked about the lack of any plane wreckage and how none of the crews were found, dead or alive... ...just vanished! "Those planes must have been completely destroyed," to which Redell replied, "Unless the saucers took them...If that theory is correct, an electromagnetic beam could have thrown off the compasses and also silenced the radios. The same could have happened to the Mariner." "But to make off with all those planes!" I said. The saucer would have to be enormous." "Well, we've had proof they use gigantic mother ships," Redell responded. "In that Gulf of Mexico case, the one-inch blip on the scope shows the mother ship was over 1,000 feet long - probably nearer 1500 feet. Also, there may have been more than one saucer in theFlorida case. Again, I'm just temporarily assuming the capture explanation." "It's still unbelievable," Keyhoe muttered. "I sat there, my mind half-numbed by the picture Redell had painted. Redell gave me a serious glance." "If it's true—and I've been fighting the idea the way you're doing now—it might explain the Navy Super-Constellation's disappearance over the Atlantic in October of '54. You probably saw the story; there were 42 people aboard, some of them Navy wives and their children." "Yes, I looked into that," I said. It occurred to me that it might have been destroyed by a saucer. 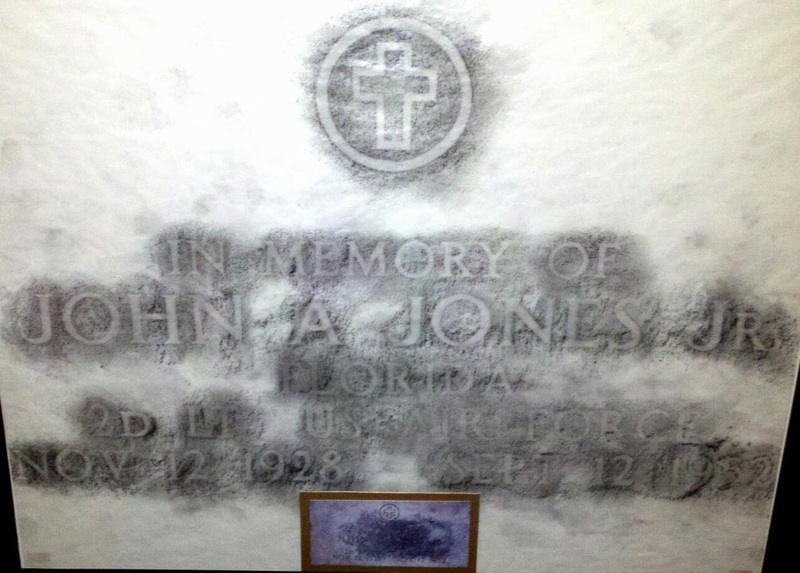 It happened soon after those UFOs were flying over Virginia." "The Navy Constellation vanished exactly like the six planes from Fort Lauderdale. Radio silence - even though they had two transmitters. Not a trace of wreckage or bodies, though hundreds of planes and ships searched for days." "I got one statement from Commander Andy Bright, head of the Navy's Aviation Section. He said they could offer no explanation." Redell spread his hands, "They certainly wouldn't make this answer public." "No, even if it was true. And there may be some strange explanation we haven't considered. But I believe this accounts for the blackout—even if the censors don't have the complete answer." "Yes, you can see why they'd fight to keep it secret." In this book, Mr. Keyhoe also reveals an incident that occurred on November 21, 1954. A Brazilian passenger plane bound for Rio de Janeiro was cruising in the dark at 8,000 feet over the Paraiba River and was approached by several UFOs. Keyhoe states there were, "19 round machines, each more than 100 feet in diameter." It was reported by the pilot, "The saucers were flashing past and underneath my wings." During this encounter, the passengers became frantic as the UFOs flew near the plane, many of them at close range. Keyhoe also stated, "For two or three minutes, the cabin was a madhouse." "The mysterious craft streaked overhead and vanished...the unknown craft had been a huge machine." This unexpected dive had thrown some passengers into the aisle and the pilot quickly radioed Washington Airport for doctors and ambulances. Keyhoe also explains, "Immediately the CAA made a check of every scheduled airliner and other cruising aircraft within 100 miles of Conowingo Dam. But not one had been near the DC-6." May 2, 1953: A British Comet (jet) air-liner met a mysterious disaster, immediately after it had taken off from an airdrome at Calcutta. Its speed was 500 miles an hour. Suddenly, it caught fire in the air, disintegrated, and crashed, the wreckage being strewn over an area of 5-1/2 miles. An investigator from the British ministry of Civil Aviation, Mr. J. H. Lett, said that lighting had not struck the Comet, nor had it come into collision with another plane, nor was there the slightest evidence of faulty materials, or bad workmanship. BUT HE FOUND THAT IT BROKE UP IN THE AIR, AFTER STRIKING SOME HEAVY AND UNKNOWN BODY! Wilkins states, "Apart from any actual collision, what was this heavy and unknown body? He adds, "Who, I must be forgiven for asking again, knows, or can, at this time know?" Do any of these plane stories from the past have anything to do with the mysterious circumstances that are still going on today? Now, fast forward to the current situation involving the missing Malaysian commercial jet Flight MH370. Interestingly enough, there are some contemporary UFO events occurring near this part of the world where our Malaysian jet, MH370 went missing. I caution the reader that Frank and I are not here to judge the authenticity of these UFO incidents and videos, but are pointing them out to you, the reader—just to be aware. Does history repeat itself? Take a close look at these documented UFO incidents over the past few years! Judge for yourself if they are real, as well as the possibility that the Malaysian jet just may have encountered a UFO during its last flight. 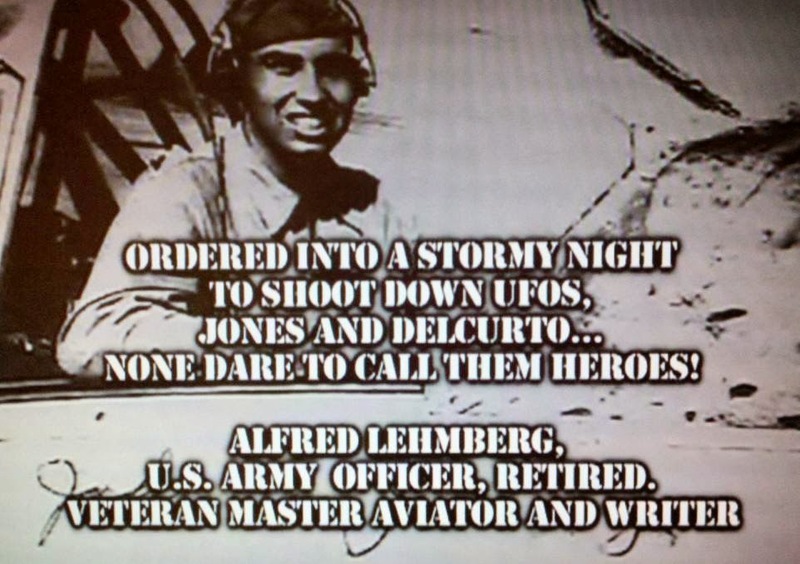 It is obvious that Major Keyhoe and many of the associates within his group absolutely knew about the UFO and plane encounters occurring back in the 1940s and 1950s. Now, I ask you, did these encounters and events ever stop? "Major Keyhoe believes that this policy of censorship is sponsored by only a few individuals; men whose motive is to protect the public from possible hysteria. But he finds this censorship inimical to the Democratic way of life: man has a chance to act wisely only if informed of all of the facts. It is the policy of silence—not the 'silence group'—which Major Keyhoe deplores." 1). In 2007, a group of maneuvering UFOs was captured on video by civilians as they flew over the city of Hanoi in northern Vietnam. This video appears on youtube and is titled, "UFO Fleet,Vietnam" by Supernatural Aliens and was published on Feb. 22, 2014. 2). In May of 2008, a Reuters news story was released about a UFO that exploded off the east coast of southern Vietnam near Cambodia. This incident occurred six miles off the west coast of Vietnam near the Cambodian border in the vicinity of the island—Phu Quoc. Debris was confiscated from the debris field below the explosion. The explosion was said to be have occurred about five miles above the ground. A most interesting observation about this mysterious incident is the point that it actually occurred just north of the vicinity where Malaysian Flight MH370 passed out over the water from the Malaysian coast just before contact was lost! The article is titled: "Vietnam reports 'UFO' explosion...HANOI (Reuters)." Again, no veracity is ascribed by Feschino or myself for the referenced video, but taken together the happenstance is compelling. Remains... ...affairs adjudged above involve the highly, highly strange, affairs understandably if not acceptably trumping the fact of anyone associated with that sad jet aircraft. This would include, as a demonstration of sincerity, the non-cavalier involvement of my own family with that sad jet aircraft, eh? Involvement with a UFO, a UFO entirely without regard to provenance of same howsoever that is determined to be... ...changes everything. The reader knows that's true.